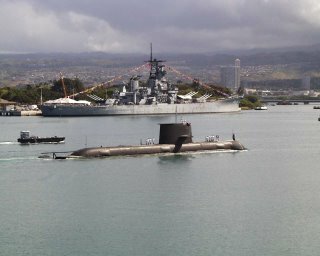 The biennial Rim of the Pacific (RIMPAC) started today; you can get all of your RIMPAC 2006 news over the next five weeks from the Third Fleet website. I expected that the PacFleet site would have something, but right now all they have are a bunch of environmental impact statements. This shot appears to show HMAS Waller (SSG 75) in Pearl Harbor during RIMPAC 2000. 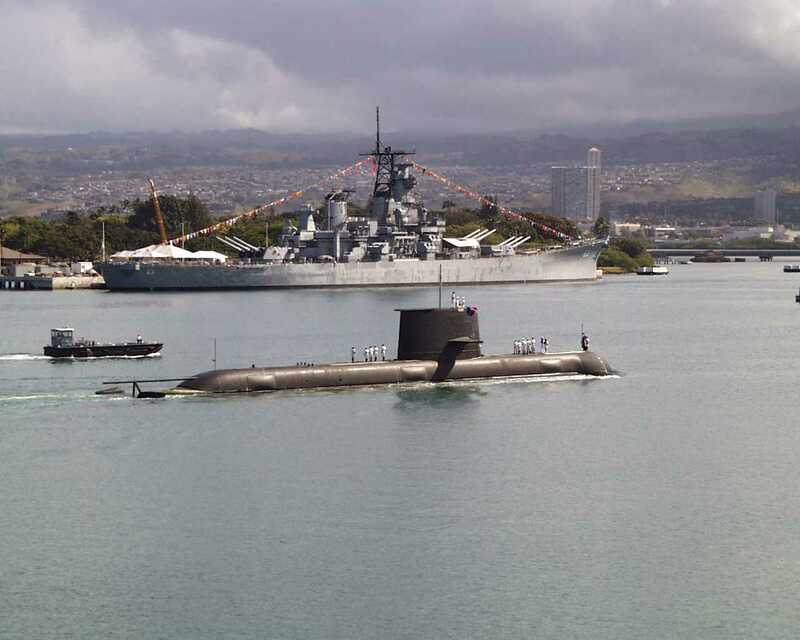 The ship in back with the big guns is, of course, the ex-USS Missouri (BB 63). Ah RimPac. Two months out of hte year when the Exchange is packed and Waikiki is a mad house. I have been teaching Korean sonarmen for a week now and can't wait until they go to sea, although the free hats and coins make it worthwhile. But for the love of God, do not get caught outdoor when colors starts. You will be standing at attention saluting for about 15 minutes. I always thought it was messed up that while we salute all our flag while the other countries' anthem are played they do not reciprocate the courtesy. My arm is falling off and I look across the harbor to a Japanese frigate, crew milling around an working while their own anthem is playing much less anyone elses. I'll try to get some shots of the harbor with all the boats in. Kind of cool. What you mean ex-Missouri? Have they renamed it? Outrager! Luckily this year, there are no national anthems being played. Now I don't have to watch foreign sailors disrespect our nation and theirs. It also lets me light a fire under a couple squadron 1 boat chiefs butts just a little faster than usual. hi, it seems like you're well informed with affairs with navy, so allow me. I'm not throwing a flame-bait, but I've read many Korean people mentioning this Korean submarine sinking 30-something ships, including a US carrier, in a simulated training at RIMPAC 2004. I really doubt this is true, and so am looking for any truth to this. You can leave answer anywhere in my blog. I'd appreciate it. Your own card is just beautiful -- and exactly what a wonderful present. Virtually any lady will be thrilled to get this specific. Many thanks for anyone creativity.